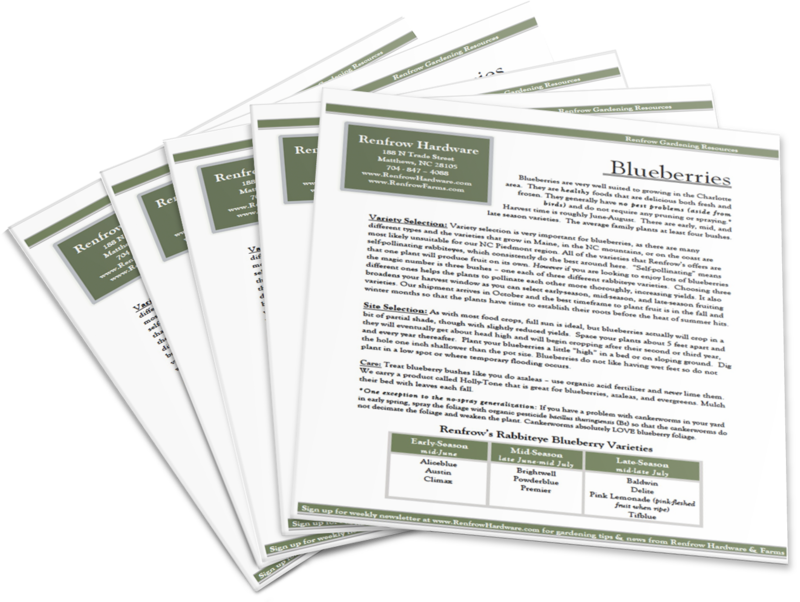 Explore our resources on how to successfully grow Blueberries, Brambles: Blackberries & Raspberries, Muscadine Grapes, Strawberries, & Figs! You can also download all of our fruit resources in their full versions at once! Download All of Our Fruit Guides Now! Harvest time is roughly June-August. There are early, mid, and late season varieties. The average family plants at least four bushes. 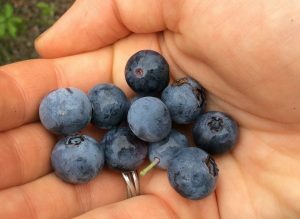 Variety selection is very important for blueberries, as there are many different types and the varieties that grow in Maine, in the NC mountains, or on the coast are most likely unsuitable for our NC Piedmont region. All of the varieties that Renfrow’s offers are self-pollinating rabbiteyes, which consistently do the best around here. “Self-pollinating” means that one plant will produce fruit on its own. However if you are looking to enjoy lots of blueberries the magic number is three bushes – one each of three different rabbiteye varieties. Choosing three different ones helps the plants to pollinate each other more thoroughly, increasing yields. It also broadens your harvest window as you can select early-season, mid-season, and late-season fruiting varieties. Our shipment arrives in October and the best timeframe to plant fruit is in the fall and winter months so that the plants have time to establish their roots before the heat of summer hits. 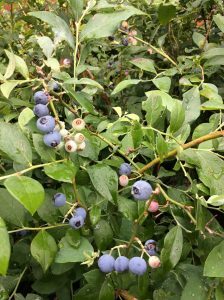 As with most food crops, full sun is ideal, but blueberries actually will crop in a bit of partial shade, though with slightly reduced yields. Space your plants about 5 feet apart and they will eventually get about head high and will begin cropping after their second or third year, and every year thereafter. Plant your blueberries a little “high” in a bed or on sloping ground. Dig the hole one inch shallower than the pot size. Blueberries do not like having wet feet so do not plant in a low spot or where temporary flooding occurs. Download our full Blueberry Guide to learn more about how to care for your blueberry bushes and discover our seasonal blueberries! You will also gain access to all of our other fruit resource guides! Backyard berries are easy to grow and have very few pest problems. Fresh berries are sweeter than their grocery store counterparts and far more nutritious. Thornless vs thorny and erect vs semi-erect/trailing growth habits are the two main decision you will need to make for blackberry varieties. Berry color is the major decision for raspberries. See our Variety Charts (below) for details about all of the varieties we carry at Renfrow’s. All brambles need to grow in a sunny location; consider their beds permanent. Set each plant about 4 feet apart and let them grow and flop – or train them up on various designs of cages or trellises. They will usually fruit the second year and several years thereafter. Download our full Brambles Guide to learn more about how to care for your blackberry & raspberry brambles. You’ll also discover our different varieties of blackberries & raspberries! You will also gain access to all of our other fruit resource guides! The best grapes suited for backyard gardeners in the NC Piedmont are the sweet slipskin grapes known as Muscadines. 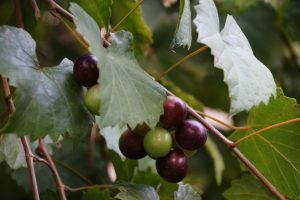 Muscadines come in two colors – “black” which is dark purple and “bronze” which is green-bronze. The bronze varieties are commonly known as Scuppernongs, though it is a misnomer and there is only one specific bronze variety officially named Scuppernong, taken directly from the centuries-old Scuppernong “mother vine” in Manteo, NC. Grapes are easy to grow and have no disease issues, but are loved by deer and birds. If you only have space for one vine, pick a self-pollinating variety. 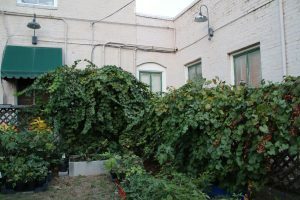 If you can grow multiple vines, the female varieties produce higher yields of larger fruit, but will need a pollinator to set fruit (a self-pollinating variety). One of the best pollinator types is Carlos, a bronze. See our Variety Chart and Variety Descriptions list for more details, both below. Grapes need full-sun and like to grow on something, be it a trellis or fence, or up a tree (like the wild grapes do). There are multiple ways to make grape trellises – ask us for some tips or grab one of the “Great Grapes” small Storey Country Wisdom booklets we sell for $3.95 that is chock-full of great information. Download our full Grapes Guide to learn more about how to care for, prune and harvest your grapes. You can also discover our different varieties of grapes! You will also gain access to all of our other fruit resource guides! Fresh strawberries from your garden are a real treat. Commercially grown strawberries are among the most pesticide-intensive fruits available so growing your own will reduce your intake of chemicals, though the superior taste of homegrown berries is the primary tipping point! Always wash strawberries thoroughly when you purchase them from grocery stores and pick-your-own operations. 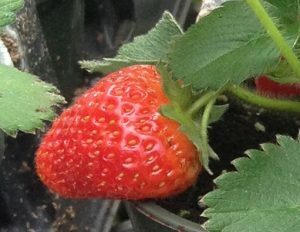 The primary choice to make when selecting strawberry plants is whether you want the berries to produce the bulk of their harvest over the course of a couple of weeks (for making jams and preserves) or if you want the harvest to be spread out over a longer period of time, which will be better suited for continual fresh eating, not preservation. 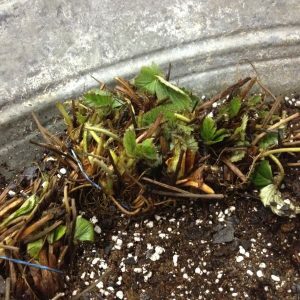 The strawberries with these two different types of growth habits are classified as June-bearers and ever-bearers, respectively. June-bearers are best suited to our climate, so if you are going to choose only one, we recommend going with a June-bearer. June-bearers are well-suited for our region and they produce fruit in May or early June and are what the local pick-your-own farms grow. These plants do not produce much during their first year when planted in the early spring, but crop heavily for a couple of weeks in May in the second year and years after. This high-density production time allows you to pick enough to freeze or make jam, and limits your bird-peck concerns to a shorter time frame. We sell several varieties of June-bearers each year. Ever-bearers are great for the backyard garden grazer, especially if you have a way to keep the birds away all season long! The plants grow less vigorously and the yields are lower in the spring than the June-bearers, but they will produce until autumn. Our top-quality strawberries come in bare-root bundles of 25 plants from a family farming operation in NC. The varieties we receive each year vary too much to list them here, but typically we have 5-8 different types that are all recommended for the NC Piedmont by both NCSU and Clemson’s Cooperative Extension Services. Full sun is best, but a minimum of 6 hours of strong sunlight will be a suitable spot for your berries. If possible, plant your berries in a spot that has not grown a member of the nightshade family (tomatoes, potatoes, eggplant, peppers) in the past couple of years. They prefer acidic soil that is well drained so a raised bed or a patch of clay soil that has been amended with compost works great. There are two primary ways to grow your berries, with the second description being the most common backyard gardening method. In the double-row hill system, plants are grown in is a double row, with the rows 12 inches apart and the plants 12 inches apart within the rows. The next double row should be about three feet over so it is easy to walk and harvest. Cut off all “daughter” plants that come off the mother so that all energy is focused on the “mother” hill. This is where your fruit will be. This hill should be replaced every year after destroying the current plants. This is the system that pick-your-own strawberry farms most often use. The matted row system is where you space your “mother” plants further apart and let some of the “daughter” plants develop so that you basically have a mass planting or “bed” of plants. Don’t let the bed get so big that you can’t easily harvest or cover with netting. Cull out and destroy about half of the biggest plants after harvest each year to keep the bed full of younger “teenage” plants for the next season. The matted row system usually gives you a few more years out of your planting. It is a good idea to destroy and replace all plants every five years or so to discourage diseases. Rotating to a new part of your garden is also a good idea. Download our full Strawberries Guide to learn more about planting, caring for/ protecting your strawberries (particularly from those sneaky pests) and how to harvest. 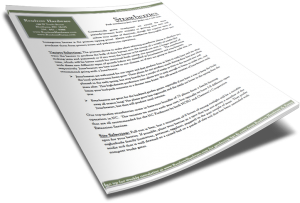 You will also gain access to all of our other fruit resource guides! 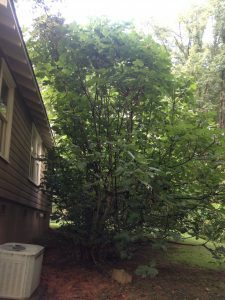 We at Renfrow’s believe that every backyard should have one or two fig bushes. Due to fresh figs’ extremely perishable nature, supermarkets cannot come close to supplying a quality product, if they even try to carry fresh figs at all. 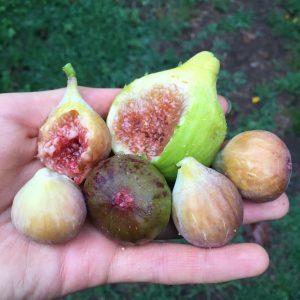 Figs are delicious fresh, but with abundant harvests you will want to find ways to preserve them, or just leave some for the birds. Figs can either be dried or made into delicious preserves & jam. At Renfrow’s we carry 5-7 varieties each year. 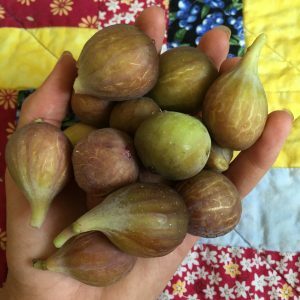 The best times to plant figs are in the fall and winter, after our yearly fruit plant delivery arrives in October, though you can still plant them in the spring. Our most popular bushes are the brown-fruited Celeste and Brown Turkey varieties, though we have other unique varieties with white, purple, and green fruit. Figs like to be grown on the sunny side of a wall or fence or shed to give them a little bit of cold protection. They grow in any soil and rarely need any fertilizer or irrigation. As with most food crops, the more sun they can get, the more fruit they will produce! They need a spot with a minimum of six hours’ daylight. Download our full Fig Guide to learn more about pruning and caring for your figs. Also, explore our most common varieties of figs. You will also gain access to all of our other fruit resource guides! DOWNLOAD OUR PACKAGE OF 5 FRUIT RESOURCES IN THEIR FULL VERSIONS ALL AT ONCE!